You always want your team to win the opening game of the season, even more so when the opposition has Telefonica emblazoned on their shirts, but CD Tenerife and their fans learnt the first of many lessons this season, losing 1-0 at Real Zaragoza. Tenerife should have got at least a share of the points, but at La Liga level mistakes are going to be punished, and missed chances will prove costly. 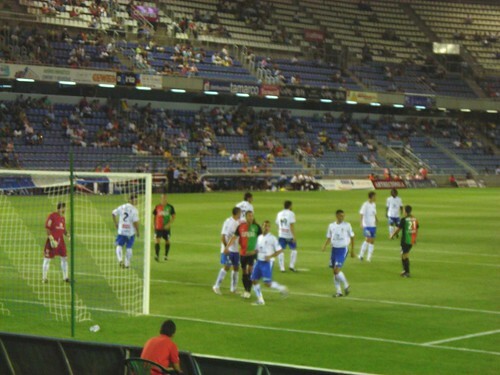 Zaragoza spent heavily in the summer, but it was a free transfer that was most familiar to British fans, Jermaine Pennant, formerly of Liverpool took his place on the right wing and made some telling early crosses. Alfaro had the best chance after 7 minutes, flashing a shot wide of the home post before Zaragoza took control for a big part of the first half. Sergio Aragonoses was as always in great form in goal, making some strong goal line blocks when the home side broke through. Sergio had to be at his best to deny Ponzo and at the other end Alfaro missed a gilt edged chance, the goal when it came was down to a defensive scramble by Tenerife. Sergio made a good save but the defence fasiled to clear the ball and Arizmendi pounced to give Zaragoza a lead they barely deserved. Coach Oltra stuck to his attacking instincts and brought on Angel and Saizar but there was to be no equaliser despite some late chances. Tenerife really should have got something out of this game but shouldn’t be downhearted, they will get sharper and wiser as the season goes on, an extra defender before the transfer window shuts on Monday night would be nice as well. Taking to the water once a year can become a big challenge for some people, personally I always face my annual bath with great resolve, butÂ Jose Brito and Miguel Cruz like to make sure that theirÂ Tenerife ripples benefit as many as possible. Just a year after a 10 day 250 km swim around the coast of Tenerife, the old sea horses are back with a new challenge, a 24 hour swim around the bay of Los Cristianos. Next Saturday, Septermber 5,Â at 5pm they will set off from the old harbour to swimÂ across the bay to the Costamar Apartments, and will continue to zap back and forth before finishing on Sunday, again at 5pm. The 2 dedicated swimmers are taking on this challenge to raise awareness of the dangers facing the local coastlines, and they willÂ find plenty to test them in this particular stretch of water. Playa de Los Cristianos is usually busy with sunbathers, the bathing area soon gives way to a selection of pleasure boats moored up, and in some cases abandoned, then it’s just a short splash to the entry and departure point of the Fred Olsen and Armas ferries. Jose and Miguel are allowed just 90 minutes break from swimming during the 24 hours, taken in short snatches to eat and drink. It’s a good job they both have strong swimming pedigrees. Jose was busy in 2004, swimming from Lanzarote to Fuerteventura, and later from San Sebastian, La Gomera to Los Cristianos. Miguel is no slouch either, three times he won the 800 metres freestyle in the Spanish championships, and was in the World’s top ten for the 1,500 metres. Good luck to the pair of them, the event is being heavily promoted by Arona council, so try to get down to the old beach to give them a rousing send off and a huge welcome back. It seemed a long way from last seasons euphoric home games as a paltry 3,800 turned up for the only friendly in the Heliodoro , Santa Cruz,Â against Nijmegen of the Dutch PremierÂ League. CD Tenerife did their best to raise some cheer with a 2-0 win that barely reflected their dominance, but the wide open spaces and chants against the club president told their own story – the fans are not happy. The decision to charge 10 euros towards the La Palma fire appeal went against all tradition across Spain for the official presentation game, normally they are Free for season ticket holders. We took our places in the Grada Popular Baja, seats still in place, they should have been removed to allow standing by now, and the expanded press area up in the tribuna, a La Liga requirement, was just a bare concrete base, cleared in recent days, although the work should be completed by now. The team that took to the pitch included our 3 new signings but was still down on firepower compared to last season. Only a week to go to La Liga, and the club is ill prepared. The game was much better fare, Nijmegen were very physical but skillful, CDT had to be at their best, and after 14 minutes Richi set up Nino who showed he is as sharp as ever, making it 1-0. The referee was pretty weak and missed some strong arm tactics from the Dutch,Â Nino got knocked to the ground and Â no penalty was given, but Tenerife were good value for a half time lead. The new boys combined early in the second half with Bellvis putting the ball into the goal area, Roman Martinez had an easy tap in and that was game over for Nijmegen. That’s 3 strong wins to close the pre season programme, lots of plus points from the players we have but against opponents below La liga strength. The new kits have been unveiled (above) and next Saturday the big test begins with an away trip to Real Zaragoza, kick off 9pm and live on La Sexta, hopefully we will have at least one more forward by then. It seems like the club directors will have us banging our heads against a brick wall all season – so we thought we would take some tips from some real headbangers. On the way back from Santa Cruz we stopped off at El Puertito, Guimar for the Goymar Fest, a rock and metalÂ outdoor feast of bands like Zen, Hollow Core, Hybris and In Blood, good fun but black marks to the bar for running out of beer. With La Liga fast approaching, CD Tenerife need as many positives as they can get from the pre season friendlies, this 5-0 win over UD Lanzarote, could easily have been a double figure win. Angel and Omar stole the show combining well up front and tearing the Lanzarote defence to shreds. The most difficult thing about the whole evening was finding a bar, 2 cars of Armada Sur drove up and eventually found the ground at the remote edge of La Laguna, then thanks to missleading directions from locals, we did a wide circular sweep of some dead end roads before ending back where we started. Striking out in another direction, we soon found some of our friends from the Frente Blanquiazul and knew a bar must be nearby. The area we headed into was the Urbanization Espirides, a mix of large grand houses and and small rough roads, eventually we found Bar Goya and lubricated the voices. There were a few strange regulars at the bar, one who looked like Neptune after a very rough night, and another arrived in a ramshackle old car covered in dents and scratches, after parking up the driver nearly fell out and got through 3 large glasses of wine before falling back into the car and driving off – maybe he was the local mayor? Anyway back to the ground, as the watery sun dissapeared behind large grey swathes of cloud sweeping in to make it distinctly chilly. A flat rate 5 euros entry was good value, the stadium looked well worn and had an athletics track and long jump pits at the side. We had hardly settled when Angel latched onto an Alonso cross and gave CDT a first minute lead, to set the tone for the game. Lanzarote had little to offer, having just scraped a sidse together after avoiding another financial meltdown. Ayoze set up Angel for a second after 17 minutes, and the speedy firecracker Omar made it 3 on the half hour with a great finish. During the half time break, we met up with Ian Lane a Brit who does the merchandising for Lanzarote, I met him on a weeks trip over ther 18 months ago, when i took in a game. The Reds were staying in Puerto de la Cruz overnight, and exchanging views, just confirmed that bothÂ clubs directors are hard to deal with and very resistant to change from outsiders. Back to the game, and it was all one way traffic by now, the Lanzarote goalie performed heroics to keep the score down but Angel was on lethal form an added 2 more goals to ensure a comfortable win. Tenerife fans were in a subdued mood, reality beckons and the club have not come through with the promised new signings, young guns like Angel and Omar may well find themselves on a very steep learning curve against hardened La Liga players. 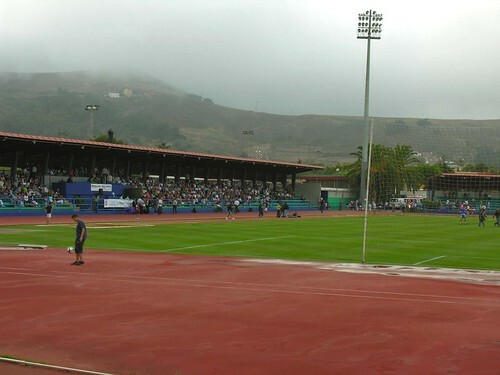 This Saturdays presentation game against Nijmegen , back in Santa Cruz has become another cause of friction, traditionally this last showpiece friendly is free to season ticket holders, but it has now become 10 euros for all, with the money going to help the fire victims of La Palma. A commendable cause but imposing the donation on all the fans has not gone down well, add a general feeling that the euphoria of promotion has been partially lost, and the scene is set for possible storm clouds over Santa Cruz. Sometimes it’s easy to miss what’s just under, or above your nose, Chayofa, just 5 minutes up above Los Cristianos, is a lovely village that I have barely scratched the surface of. A Sunday dinner invite proved to be the perfect chance to rise above the heat of the tourist south of Tenerife, and feel the cool air whilst checking out la Finca del Arte, bistro and art gallery. Set on an old banana plantation, heavily shaded and with a serene peace, La Finca del Arte has a big reputation for good food and artistic expression through sculpture, paintings and live music. 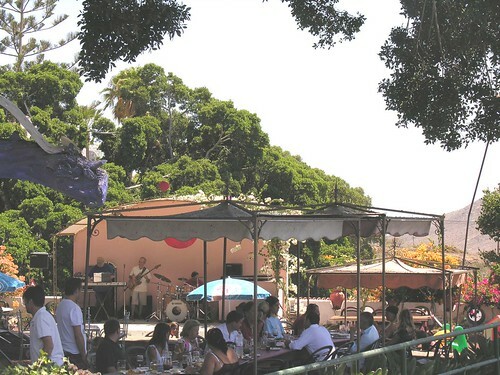 Thursday nights are guitar nights with a South American twang, but Sunday afternoons mean live jazz and a barbecue brunch on the leafy terrace that looks down on the large garden with its stage set against MontaÃ±a Guaza in the distance. Holding back my hunger, I explored in the converted barn that houses a large collection of art from local based artists, and also has a stylish restaurant for daily meals from 11am to 10pm. The paintings and sculptures are all for sale, in various sizes from small to where did that wall go. I was fortunate to be introduced to Juan Carlos Martin Diaz, a sculptor, originally from Salamanca, who moved to Tenerife in 1992. As he flicked through his photo collection of his works, I was staggered by the quality and diversity, and pleased to recognise a few familiar sights from my travels, such as the statue of Hermano Pedro in Vilaflor and a fountain from Guimar. Many people have walked by one of his more recent works every day by the old beach of Los Cristianos, the small shrine to the Virgen del Carmen is a scaled down model of a full size statue sunk in the harbour to bless fishermen. The gallery was no place for my rumbling stomach, so I joined my friends outside and we ordered our food, I could see and smell my meat cooking on the barbecue, and soon dived into my large plate of chicken, sausages, steak and pork ribs, backed up with salad and potatoes. By now the tables were filling up nicely, in the shade and down beyond the bar in the sun drenched garden, as the musicians struck up, keeping a relaxed tempo going as food and drink were enjoyed. Sunday afternoon is also popular with local singers who come along to jam with the house band, it’s pretty well open mike to all. Wandering round, fully stuffed, I found some partly hidden sculptures as well as a current banana plantation struggling along next door. Even a short drive up from Los Cristianos, the drop in temperature is noticeable and welcome during such a strong heatwave, but the relaxed setting, good food and soothing music, all go to make this a special place to visit. La Finca del Arte is closed on Mondays, otherwise pop in from 11am to 11pm any day. To see what special events are coming up, check the website. There was no doubt about it, his woman had done him wrong, life was cruel and he didn’t get no respect. So much for the tortured soul, belting out the crackly vinyl blues on a modern sound systemÂ at Casa Elias in downtown El Sauzal. As for me, I was feeling pretty chipper, a plate of tapas in front of me, a cold drink, and the church of San Pedro Apostel in my line of vision. It was clear looking at the drum and guitar on the wall of the main bar, that this was a music venue, posters proclaimed August as a month of “Musica y Mojitos” and even the lizards on the garden wall looked pretty mellow. It was all well worth the early start for an 8.30am, 110 Titsa from Los Cristianos to Santa Cruz, 1.45 euros on the Bono, prompting a free 30 minute tram ride to the La Laguna terminus. A brief walk through town to the bus station brought its reward with an unexpected floor show. An o51 bus reversed out of its berth and bashed into a stationary 230, theÂ aggreived driver got out, and casually ripped off a hanging length of rubber and drove off to do his run. The reverser was going to leave the scene too, but a young waiting passenger let rip with a tirade of verbal and hand signal abuse, ready to add to his bad morning, the driver leapt out of the cab and squared up to Mr Angry, but before fists could fly, other drivers split the pair and the driver chugged away. All this was played out in a surprisingly casual manner, no reprimands or mountain of paper work seemed to be heading the way of either of the drivers, even though it was like Robot Wars meets On The Buses – and all before 11am. I was still smirking as my o12 Titsa took the one euro, 30 minute journey to El Sauzal, even the twin delights of Guamasa’s Dolce Vita Swingers Club and Piss Pass cafe had to settle for second best on my chuckleometer. Getting off in the Casco El Sauzal, the old part of town, I was immediately impressed, you can tell a lot by the look of a place, and this was bright,clean, well kept and with plenty of signs and tourist information. 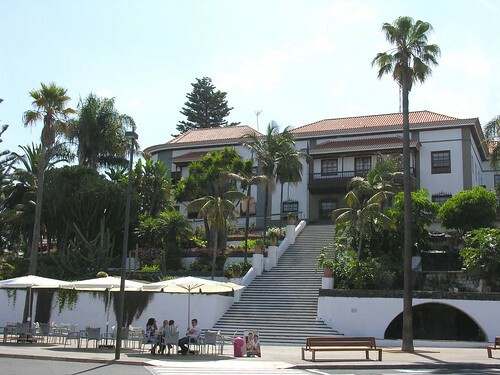 The ayuntamiento (council) buidling held centre stage, a pretty standard design of white building with traditional Canarian wooden balconies, it stood on several terraces of plants and flowers with a small waterfall and a cascade of concrete steps down to a pavement cafe. The nearby church of San Pedro Apostel was also well worth a walk round, built in 1515 and used by the Tenerife cabildo (government) when La Laguna was devestated by the plague. The views out over the valley and to the sea were wonderful, but the best was yet to come. a short walk along the main road brought me to the Parque de los Lavaderos, 8,000 square metres of natures finest, based around a natural water source where locals gathered to do their washing. The trees and shrubs were pretty impressive from the entrance, but once I followed the stone path down through the layers of the park,Â I realised what a wonderland this is. Water channels still burble through the bushes, but small turret like buildings have been added and seats and mini plazas appear in shady rest spots. The council have struck a fine balance between maintaining the park, and allowing nature some free expression, the water channels are lined with moss and weeds, a perfect habitat for tadpoles, fish and red and blue dragon flies. Lizards lurk in the undergrowth and the flowers blooms add a spread of glorious colour, complemented by the views out to sea, and along the coast to Puerto de la Cruz. Next time you have a meal out in Tenerife, make a point of ordering a local wine, it’s another part of the rich heritage of the island, even William Shakespeare was found of a drop of Malvasia wine. 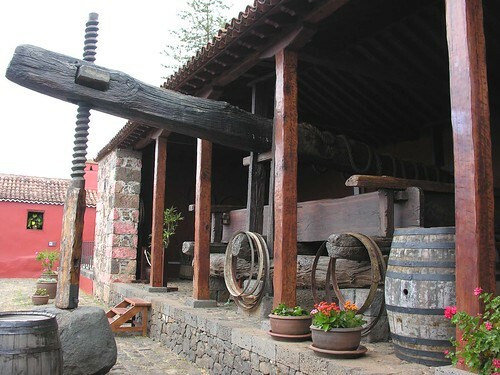 The north of Tenerife is the stronghold of the wine growing industry, so it is fitting that Casa del Vino lies in El Sauzal, a few miles from Puerto de la Cruz, and near Tacaronte, famous in its own right for fine grapes. 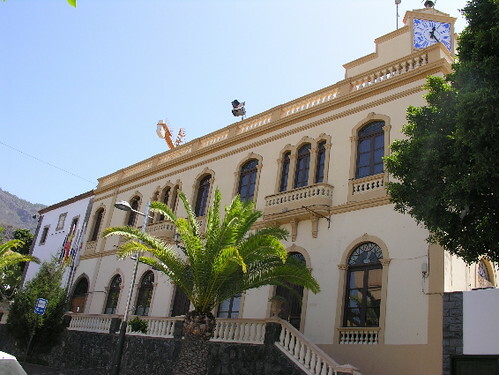 It was around 5 years ago thatÂ I last visited the combined museum, exhibition halls, tasting rooms, and administrative centre for Tenerife’s wine output, and it is still a FREE attraction with much to recomend it. Perched on the lip of a steep hill, views on a clear day are stunning, of the valley below, and Mount Teide above, this afternoon the cloud had descended, wellÂ I had made good use of the sun earlier in the day in El Sauzal town below, more of that in the other post. The Casa is an old 17th century farm house, built around a large courtyard, with an old wooden wine press making a natural centre piece. 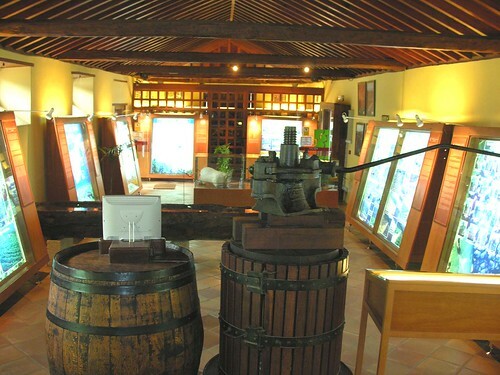 The museum tells the story of the growth of wine in Tenerife, and its journey out into the wider world, it now has a formidable reputation. For much of the north of the island, the wine trade provided jobs and security, in recent years its value has been recognised and quality control and regional brand names have made sure it takes its fair share of prizes at prestigious tasting events. Talking of tasting, for a small charge, you can taste a few wines and get a few pointers on what to look for,Â I had brought along a pint glass, but they were not having that, so I had a few gentle sips and tried to look knowledgeable. Regular courses are run through the year for those who want to educate their palate, homework will no doubt be keenly undertaken. Attached to the main building is the newer Casa de la Miel (House of Honey) charting the rise of this sweet product,not widely recognised as a Tenerife speciality. I went to a place called House of Honey in Amsterdam many years ago-but it was quite different to this. 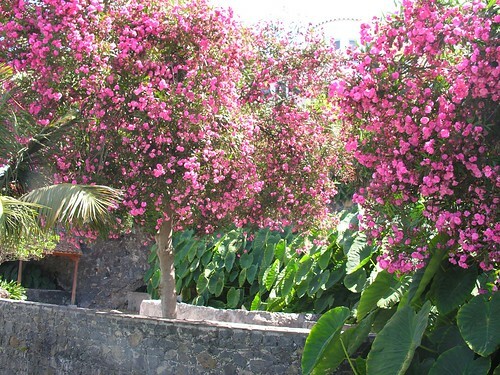 The varied flowers and fauna help to influence the taste of Tenerife honey, there are nearly 500 producers in Tenerife these days. Most regional craft fairs will have some honey on offer, but the main Casa del Vino store has a good range, and of course plenty of wine to sample at home. 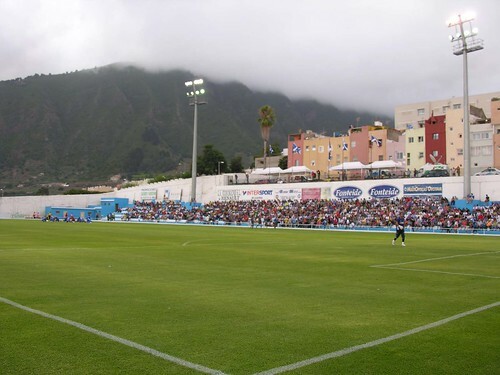 Time to pick up the pace a little, CD Tenerife took on Real Sociedad last night for the Teide Trophy in La Orotava, there was to be no pre season silverware though, as their former Segunda division rivals snatchedÂ a 1-0 win. Leaving the scorching south, we found the chill and cloud of the La Orotava valley quite a contrast as we met up with our blue and white comrades in a pre arranged bar, just down the road from the ground. There was a good sprinkling of island based Sociedad fans, and a good few hundred of the all singing, all dancing peÃ±as of CDT in our far corner of the ground, our police guard had swung from last years in your face close scrutiny to a more laid back, hardly interested approach. Super Mario made an appearance but had a rival in the “what planet amÂ I on ” department, with a drunk, wobbly local who looked like an extra from a scouse soap. A mintes silence was held before kick off for the 26 year old Espanyol captain, Dani Jarque, who died of a heart attack the previous day, and players wore black armbands. It was a young inexperienced line up for Tenerife, Airam and Angel led the attack, and their youthful enthusiasm gave Real problems in the first 15 minutes, Airam had a good shot saved. Sociedad looked strong and came more into the game while Dani Kome prompted CDT attacks from midfield. The first half ended 0-0 but Sociedad came out strong after the break, and within 7 minutes some sloppy defence by CDT left Estudo to beat Aragonoses for a 1-0 lead. 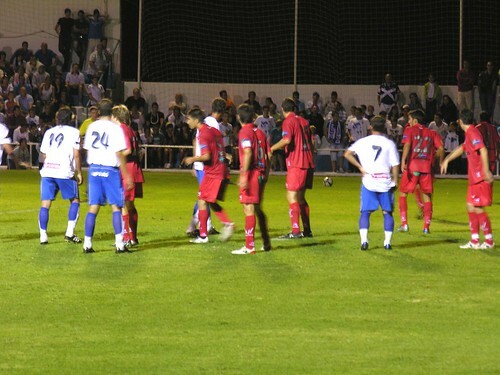 That sparked mas substitutions as Tenerife brought on 7 of the more experienced players, including Nino. It certainly spiced up the Tenerife attack, Nino and Richi both went close, but too many shots were going high over the goal. Late in the game Tenerife had a fierce shout for a penalty, but it wasn’t to be and the trophy went to Real Sociedad. 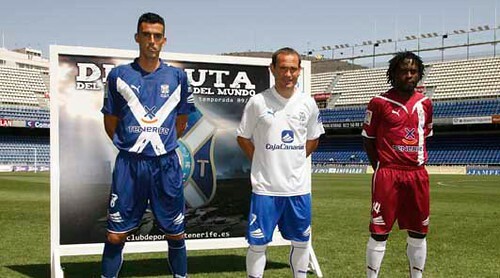 A much sterner work out for CDT against a side that should be one of the front runners to join Tenerife in the Primera. Many of the 4,000 crowd swarmed onto the pitch as both sets of players posed for photos with fans. As we headed back to the car, there was time toÂ weigh up lessons learnt and the need for at least a couple more new players, certainly up front.Â Not a good end to the night for the few people who had parked in the shopping centre car park, only to find it now all locked up, thankfully we didn’t fall for that schoolboy error. 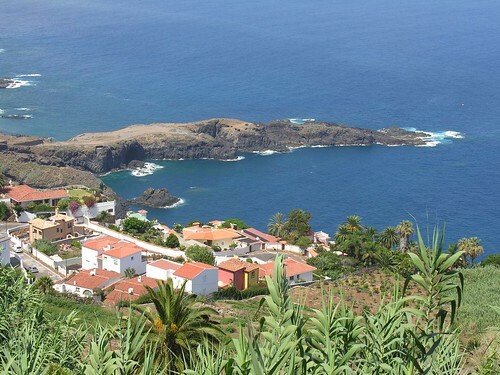 It will be just over a week until we can see CDTÂ v Lanzarote in La Laguna, in the meantime, they are off for a fewÂ more friendlies on tne mainland, and we willÂ plan and ponder as the days tick down to the start of La Liga. Bring me a postage stamp and a pen, I will write allÂ I know about surfing on the back of the Queens head, still leaving adequate room for a small novel. Even after hours stood on my ironing board on the balcony, I have to admit to not having any of the skill and co-ordination of the many surfers who cut through the Tenerife waves with such grace and flair. Mind you, that doesn’t stop me from admiring the talent of those that are at home on the foam, that’s why I headed from Adeje (see post below) to La Caleta for the 4th annual Canaries bodyboard competition. The timing was good, with the Virgen del Carmen fiesta in full swing this weekend, the sun baking, and most of all, the Atlantic throwing in some towering waves. 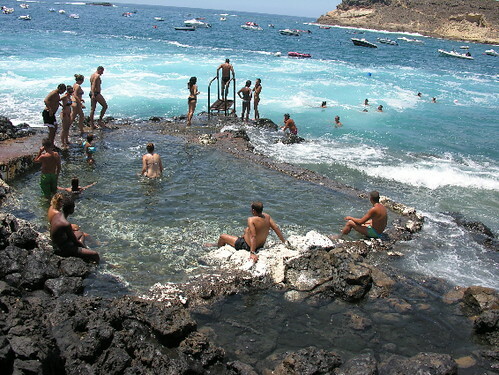 La Caleta often has lively surf, andÂ I noticed on arrival that PlayaÂ de la Enramada was pleasing sun seekers and bathers with fair sized rollers, but between there and the old village of La Caleta, the best and biggest waves were right on schedule at one of the jagged rocky points. The tight bunting adorned streets leading to the sea were packed with camper vans, and every homes terrace was the setting for a lively and colourful party to enjoy the twin pleasures of fiesta and sport. 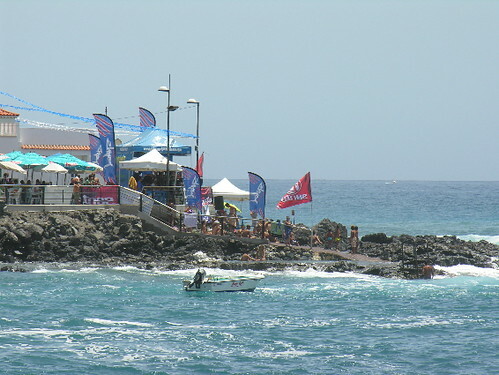 Fish restaurants cling to every rocky stack overlooking the sea, theÂ surf judges had their own littleÂ canopy set up just in front of a fishy terrace, as competitorsÂ awaited their call to take to the water. 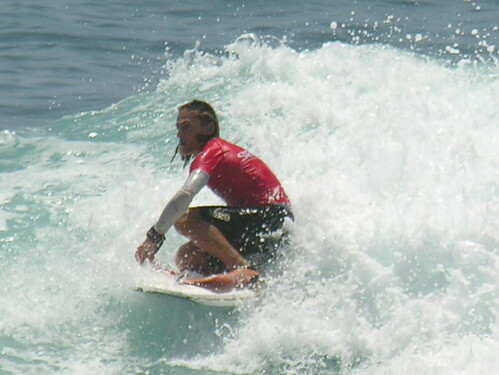 A P.A system and fog horn blast kept eachÂ surfer informed of their time slot for each category. Competitors each paid 20 euros to enter in the open, female, drop knee or local Â category, with 2,000 euros of surf gear up for grabs as prizes. A 15 or 20 minute spell to impress sounds a fair bit of time but catching the right wave and then getting back into position for the next cuts that down considerably. The coast in this area is full of sharp outcrops of rock, next to the event zone, bathers relaxed in rock pools, but the surfers in just shorts and tshirts rose and fell, and cruised and crashed in the surf without troubling the Red Cross attendants with as much as a graze. The finer points were lost on me , I’d be happy just to stand up, but for those who want to see the full results and look out for future events, try www.fcsurf.esÂ It’s back to the ironing board for me. The spirit of Arkwright lives on, I’m not sure if they are Open All Hours, but theÂ Bar LaÂ Estrella in Calle Grande, Adeje with its combined bar and newsagents brought to mind that old cccccc cantankerous shop keeper made famous by Ronnie Barker. The shop and bar look seperate neighbours from outside, but one bar/counter unites them inside seperatingÂ my morning coffee from a selection of sensible hats, tacky souvenirs, magazines and papers. Smack in the middle, squatting on 2 low chairs, Mr and Mrs AÂ were glued to a re run of last nights Real Madrid friendly and I seemed to be an unwanted distraction. 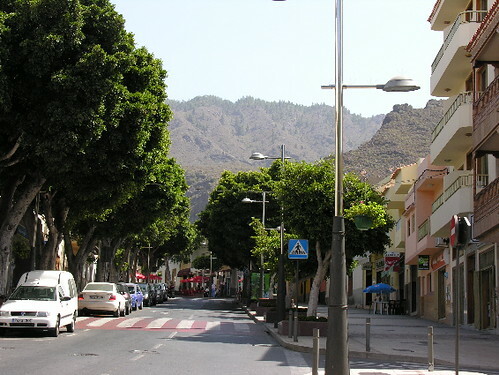 Â Never mind, onward and upward, literally, as the shady tree lined Calle Grande meanders uphill to the Ayuntamiento (council) building (pic) and the old church plaza. It must be about 8 months since my last visit, when notices warned of impending work to the crumbling old walls surrounding the square. It seems that the work is more intense than I expected, high fences now seal off much of the plaza as a huge crane lurks behind. The large works billboard has a familiar look, and shows the logo for Plan E, a Spanish national initiativeÂ forÂ urban renewal Â with the commendable logic that it’Â s better to pay the unemployed to do small overlooked Â building projects, and give them some pride and purpose. Turning the top corner towards Casa Fuerte, the old run down castle, I noticed lots of building, large and small going on in the newer part of Adeje, and a notice warning that the popular walk, Barranco del Invierno is closed. 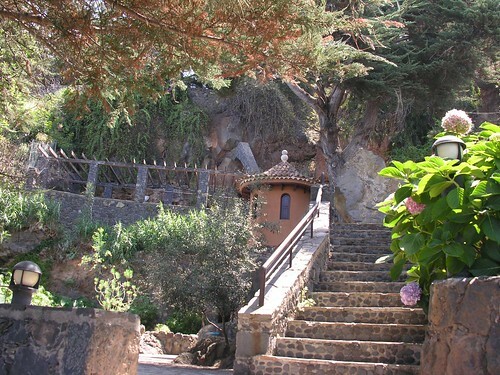 The Barranco is undergoing a month (Canarian timescale) long revamp costing 361,861 euros, improving the path and cutting back intrusive plant growth. 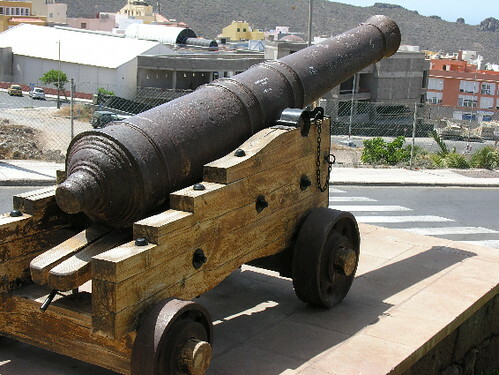 Being a nosey git, I had a good look round the side and behind the Casa Fuerte, guarded as ever by the old canon. 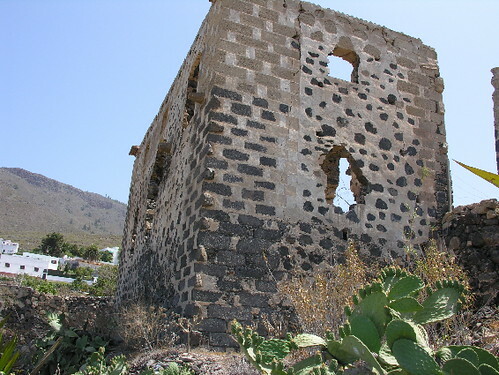 I don’t think there are plans to repair it anytime soon, but even in its rundown state, it has a strong prescence, a reminder of more vulnerable days when many people coveted Tenerife. It’s quite a border line for 2 eras, on one side, the new town growing at a quite frightening rate, and on the other, the terraced landscape dropping away to the Atlantic with the island of La Gomera beyond, emerging through a fluffy wrapping of cloud. Coming back down into old Adeje, there is a nice mix of old and new low level housing, a large popular plaza with childrens play area, and some smashing coffee and cake shops, which I felt duty bound to visit. Los Olivos has been blighted withÂ the worstÂ aspect of this area,Â aÂ new stark concrete church, sealed off with its own small plain plaza, it would give Prince Charles sleepless nights, not so much designed butÂ line drawn on an Etch a Sketch by a cubist. Luckily that was my exit point for the bus to La Caleta.